With the score tied at 49, the Georgia Tech Yellow Jackets began a 10-0 run to put them up 59-49 with 4:46 to go. That would be the last time Georgia Tech scored. Miami utilized a dramatic 15-0 run over the final few minutes to secure a critical win in conference play, defeating Georgia Tech 64-59 Sunday afternoon. Woods, a redshirt junior, hit two huge threes in the final minutes, part of a 13 point effort that saw her hit perhaps her biggest shots of the season. 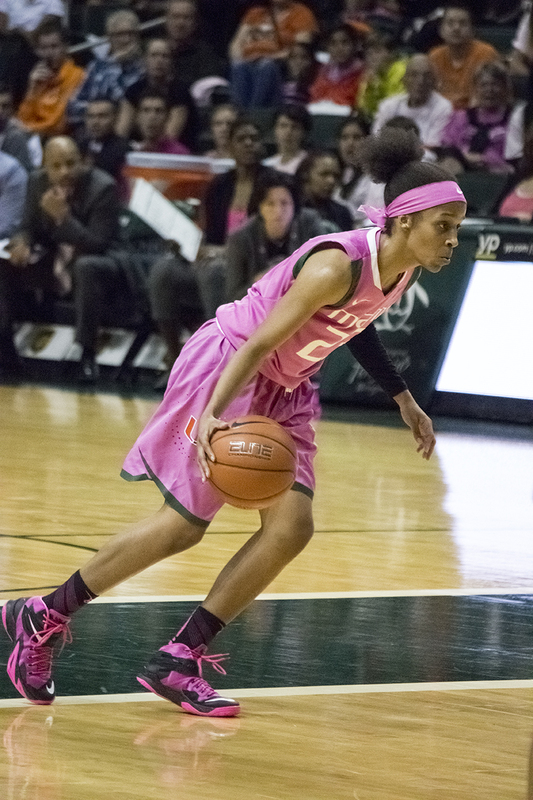 The Canes had three players in double figures, led by 18 from sophomore Adrienne Motley. Nigia Greene added 11 for Miami, while having one of her best all around games of the season, tying a career high in steals with three and playing great defense throughout. Miami will hit the road Thursday for a tilt with N.C. State, before returning home this weekend for a matchup with North Carolina. With eight ACC wins and five conference games remaining, Miami sits in a great position in its efforts to return to the NCAA Tournament.